Kurilpa Futures | Putting people and communities before developers in the planning for the Kurilpa area. 16th April, 2019 – Kurilpa Futures has invited candidates for the Griffith Electorate, in the upcoming Federal Election, to provide responses to a series of questions we think are important to the Kurilpa Peninsular. These responses can be found here as they are submitted to us. 10th April, 2019 – Kurilpa Futures believes that the only viable way forward in our neighbourhoods is to reduce the reliance on private motor vehicles and promote active transport. It is our hope that Kurilpa will become Australia’s Most Walkable and Rideable Community. In preparation for Cr Sri’s upcoming community forum, we have prepared the attached paper, “The Future of Mongaue Road”: How will we move in an ever-crowded Kurilpa?’. The West End and South Brisbane neighbourhoods are literally bursting with new development. The Qld Government forecasts population in these areas to TRIPLE in size between now and 2041. These increases are caused by the failings of the South Brisbane Riverside Neighbourhood Plan and successive development approvals exceeding the limited requirements that do exist. Without consideration of how we are going to cope with the rapid influx of new residents and the issues surround land use planning and diversity in the neighbourhoods surrounding Montague Road, any efforts to relieve today’s traffic problems face the threat of being obsolete before they are implemented. This is the response that we’ve received from Grahame Quirk, on the 5th April, just after his retirement. Our paper was about a coherent view for the Kurilpa Peninsula of more than 600 hectares. The Draft Kurilpa Master Plan, which he claims would have met these problems, was for an area of 25 hectares and was, in its excessive provisions, a good example of the problems we want to resolve, and our paper systematically addressed. 30th January, 2019 –There has been a move in Brisbane inner city suburbs to have the speed limit for motorised vehicles reduced to enable a more compatible interaction between foot traffic, cyclists and drivers. Kurilpa Futures is supporting this movement with the following media release and the resulting map of a study of the current speed limits throughout the peninsula. We also have a limited stock of car stickers available for a gold coin donation. 4th November, 2018 – Revamping West End Planters – Kurilpa Futures, under the guidance of local landscape architects John Mongard and Todd Gallagher, have assumed the task of revamping the planters that were installed in 1992. See further details here. 18th September, 2018 – PARK(ing) Day, 2018: West End Uniting Church, Tangara Social Club and Kurilpa Futures will participate in the International #PARK(ing) Day this Friday (21st September) from 11.00am in Sussex St, West End, next to the Uniting Church. Come along. 9th August, 2018 – Davies Park Upgrade – Members of KF have developed some further ideas on how to save the community garden in its current location at Davies Park. We have also added some ideas about what we want in our green park (seats/shelter/play/gardens/park stuff), since the BCC plan was bereft of any detail. You will find these latest ideas here. If we don’t ask for the green park elements, council will spend all the money on roadworks and drainage (they estimate $800,000), and a toilet ($200,000). That leaves only 1.1 million for the park works! The round park area in the plan is the same size as Bunpappa park, on the corner of Thomas and Vulture Sts, that cost 1 million so you see it will not spread to all the things they show, and to the things they don’t show. We request that you all support getting an actual park and improving the community garden. Any money left after that, if any, can go to their infrastructure works. The last consultation is this Saturday at the markets, 8-10.30 am, and online at the link given previously. Please take the time to support these elements so we get what we have asked for ,in these years of waiting for a second park! 10th July, 2018 – Priorities Survey: We are interested in what you, as a member of the community, consider to be our top priorities for the next year or so. To collect this information we have compiled a short survey and would appreciate you filling this out for us before the 20th August. It will only take a couple of minutes. You will find it at this link. 6th July, 2018 – June Newsletter: Check out our June Newsletter to see what we’ve been doing. We’re going to try to put these out regularly to keep the community informed about our activities. 3rd March, 2018 – Crown Towers – In response to community concerns Deputy Premier (and Member for South Brisbane) Jackie Trad has written to Lord Mayor Quirk, re the development application by Crown West End Pty Ltd, for 117 Victoria St, West End. A copy of the Deputy Premier’s letter can be found here. So far the Lord Mayor has acknowledged the receipt of this letter but, to our knowledge, no further response has been received. 19th February, 2018 – Crown Towers in West End (Victoria St) – Currently there is a development application (DA) with the council for 117 Victoria St, West End. The developers are Crown West End Pty Ltd (Crown Group). Yesterday a community meeting was held in Victoria St where local residents joined to show concern at the lack of compliance, of this DA, with the South Brisbane Riverside Neighbourhood Plan. This development has been designated as Code Assessable, officially giving locals no opportunity for input into this development. 29th November, 2017 – Davies Park Renewal – Brisbane City Council is seeking feedback on the Davies Park Renewal project. Local landscape architect John Mongard believes this project provides an important opportunity for an alternative community response. Village Green – John is proposing a Montague Road village green demonstrated in the diagram below. Kurilpa Futures supports John’s vision as the most effective use of limited funds. 27th November, 2017 – Kurilpa Futures’ State Election Forum – South Brisbane. Details can be found here. 7th September, 2017 – Working Bee – As a result of ongoing collaboration between the Environmental Club at WESS, John Mongard and Todd Gallagher (John Mongard Landscape Architects and the Greenspace Strategy for 4101) and members of Kurilpa Futures, and sponsored by Turrisi Properties, the first stage of this project was successfully completed in a Working Bee on the 3rd September. You can check out some photos from the event here. Additions to the project are planned as part of the building extensions to the school. 20th July, 2017 – Submissions on the Draft Local Government Plan are due tomorrow (21st July). Here is the document that Kurilpa Futures has compiled listing relevant concerns. If you wish to submit your own concerns you can do so by sending them to: CPAdmin@brisbane.gov.au. You are welcome to use all or part of this document as a basis for your submission. Paste into your wordprocessing (Word, etc) document and edit as necessary. 12th July, 2017 – “Developing principles to create cities that are good for us is not easy. Who decides what is good? And for whom? We desperately need a big and general public discussion about his.” Read the article from The Conversation. 20th June, 2017 – We wish to acknowledge the announcement by the State Government and commend the long awaited move to open a new secondary school and extend WESS to cater for the shyrocketing population in the South Brisbane area. 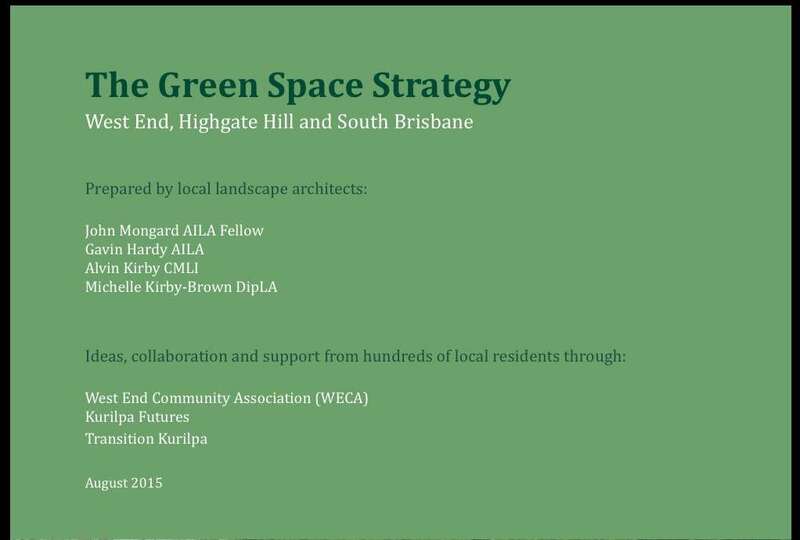 12th June, 2017 – The Green Space Strategy for the Kurilpa Peninsular has been updated to include recent activities such as – the Thomas St tactical activism, gully strategies, flood strategies, Hargreave Rd verges and the Sussex St parklets. 6th June, 2017 – If you haven’t already voted in the Public Space Infrastructure Fund online voting system have a look at the website (https://gabba.freewill.vision/), where the concept is explained, the nominated projects are listed, and you can have your say as to which of these projects should be funded. 4th March, 2017 – in response to community concerns re increase in traffic in the area Brisbane City Council has made a survey available to residents for a proposed Local Area Traffic Management Plan. Kurilpa Futures has written to the council with concerns on this topic. Our letter can be found here. 7th February, 2017 – Last year members of Kurilpa Futures met with representatives of the South Bank Corporation concerning its redesign of the South Bank Master Plan. In this document we have listed our concerns and the principals that the local community has indicated should underpin the new plan. 3rd November, 2016 – South Bank Master Plan: South Bank Corporation invited members of Kurilpa Futures to meet with them on the 17th October, where Professor Catherin Bull, Chair of South Bank Corporation, presented the corporation’s vision for the South Bank Master Plan. At a second meeting members of Kurilpa Futures discussed a submission that we will make to the South Bank Corporation with our concerns over the direction of the ongoing development of South Bank. Minutes of the initial meeting with Professor Bull. A list or the principles that we, as a group, consider should be included in the Master Plan. This is a document that is in the process of being developed and we welcome input from the wider community. Versional updates will be made available here. 19th October, 2016 – West End Festival Forums – West End Community House will host three open air forums in the early evenings of the last week in October at the much loved People’s Park in Boundary Street. Find the program here. 18th March, 2016 – Shadowing of large buildings can be of considerable concern. These diagrams of the recently approved Development of the “Absoe” site along West End’s Boundary and Mollison Streets show the effect that these buildings will have on the local area, especially on Wilson and Little Jane Streets.